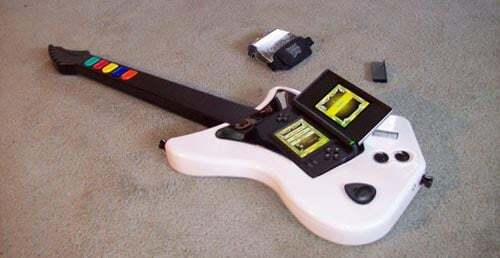 Check out this amazing mod for Guitar Hero on the Nintendo DS, made by modder Eric Ruckman. This cool Guitar Hero Controller uses a wireless PS2 Guitar Hero Controller, and cut out all the insides, as you can see from the photo the DS fits neatly inside the PS2 Guitar. The controller buttons are connected to the DS by wiring tinto the adapter and Eric has also added a wireless FM transmitter so he can play it through his home sound system.